The number of pastoralists maintaining production systems with small numbers of traditional breeds of cattle decreased dramatically with the modernisation and industrialisation of agriculture in Europe during the twentieth century. While these pastoral systems were not compatible with agricultural industrialisation policies, they provide a far better match to current European Union (EU) policy with its emphasis on high nature values and various cultural heritage protection measures. Today, these farms can obtain EU funding for preserving natural and/or cultural heritage values rather than producing agricultural goods. Although such EU subsidies make a welcome contribution to the livelihood of traditional farmers, the critical definitions that have to be made regarding what is considered traditional or non-traditional can be problematic. 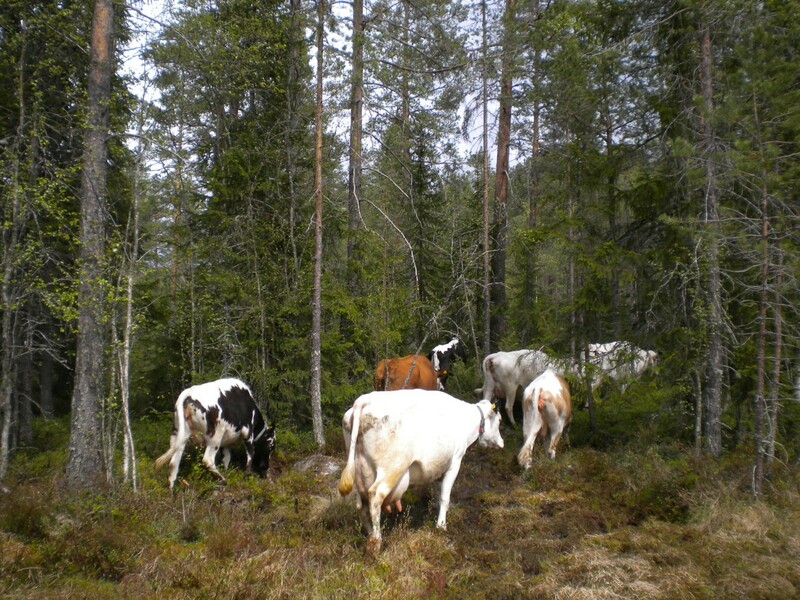 This paper provides an example from Swedish fäbodbruk, a smallholder system of forest pasturing with traditional breeds of cattle, goats and sheep in northern Sweden. As policymaking and agricultural subsidies during the twentieth century reflected the contemporary political agenda of that time, farmers have been subjected to many changes in priority in political decision making. The contemporary push for traditional farming and heritage has made policymaking potentially even more difficult, e.g. as regards the question of what should be considered traditional and what makes up natural and cultural heritage. This paper examines how farmers are affected by valuations and assessments made by the relevant authorities on whether they are producing natural and/or cultural heritage. The attention to agriculture's role in creating cultural and natural heritage values rather than merely producing food and fibre has intensified in Scandinavia during the last decade (Setten 2005; Daugstad et al. 2006), just as in broader discussions of European agricultural change (cf. Van Huylenbroeck and Durand 2003; Wilson 2007). This revaluing of agriculture's role is part of what (Lowenthal (1998)) has called the 'cult of heritage' that characterises late modernity, where 'Nostalgia for things old and outworn supplants dreams of progress and development. A century or even 50 years ago the untrammelled future was all the rage; today we laud legacies bequeathed by has-beens'. This new view on agriculture's role is also reflected in current European Union (EU) subsidies that are targeting the maintenance of natural and cultural heritage, thus endeavouring in the difficult task of assigning monetary values in the form of subsidies on heritage. Since Sweden joined the EU in 1995, specific subsidies have been available for maintaining the practice of fäbodbruk, seasonal forest pasturing at summer farms (fäbodar). The rationale behind the funding is somewhat puzzling, as it stresses that a given grazing pressure is desired, but provides vague instructions on the summer farm having to be kept in accordance with tradition. This has caused much administrative difficulty for the regional county boards, as the Swedish Board of Agriculture only states that 'the county boards are to consider the number of animals, the type of animals and the traditional use of the summer farm' (SJVFS 2011), author's translation) when deciding what land can be given a real support through the EU-funded forest grazing scheme (fäbodbetesstöd). Important issues are how the authorities determine what is considered traditional and how farmers are affected by these decisions (or rather lack of decisions). This paper provides two examples of how the Swedish authorities have dealt with issues of natural and cultural heritage in relation to summer farms. The first example concerns the case of pedigree versus unrefined traditional breeds of cattle, and the second that of grazing subsidies conflicting with predator policies. In central and northern Sweden, farming systems were traditionally based on animal husbandry and depended on utilising outfields (mainly covered by boreal forest) as summertime grazing for cattle, sheep and goats, as arable land was scarce. During the summer, farmers moved to simple dwellings on summer farms (fäbodar) to graze the animals in the forest (Figure 1). Today these fäbodar often lack electricity and running water due to their marginal location or for more symbolic nostalgic reasons. The Swedish transhumance system, fäbodbruk, is identical to the practice of seterbruk in Norway and similar to Almwirtschaft in the Alps and transhumance systems in the Carpathians and Pyrenees (Lidman 1963; Montelius 1975). Historically, animals were tended by hired milkmaids on the summer farm, whereas today these tasks are generally carried out within the family as increasing labour costs during the twentieth century have generally rendered it economically unfeasible to hire personnel for small farms. Cars have made it possible to commute between the main farm and the summer farm, which means that it is not necessary to live on the summer farm during the summer months if it is within daily commuting distance (Figure 1). Summer farm (fäbod). Summer farms accommodate both people and animals but are simple and usually lack electricity and running water due to their location in marginal forested areas. However, this lack of facilities is often appreciated today, as it preserves farming practices and gives the summer farm a genuine feeling. It also has some practical advantages, such as being low-maintenance during the harsh Swedish winter. This picture was taken in Arådalen, Jämtland County, in September 2010. During the rapid industrialisation of agriculture that took place in the decades after the Second World War, central and northern Sweden was deemed unsuitable for rationalisation in terms of creating large-scale industrialised farms. Therefore farming in these areas was to a large degree abandoned, and the few farms that remain continued to be small-scale. The number of farmers using summer farms and forest pasturing in Sweden has dramatically decreased from an estimated 20,000 in the late nineteenth century (Larsson 2009:382ff) to around 250 farmers today as a result of technological development but also deliberate policies aimed at rationalising farms into larger-scale, specialist units. In comparison, in neighbouring Norway, where rural policies have sought to maintain traditional farming to a greater extent than in Sweden, the number of working summer farms with dairy cows is currently around 1,300 (Stensgaard 2009). Considering that the total population of Norway is only around five million people compared with Sweden's nine million, it is remarkable that Norway has more than five times as many summer farms in use. There could of course be a number of reasons behind this difference in numbers, but it can be taken as an indication that politics and agricultural policies matter. In the remainder of this paper, Swedish fäbodbrukare, smallholders keeping summer farms, are referred to as 'farmers' for simplicity and ease of comprehension. On the 250 summer farms that exist in Sweden today, the production system differs. Some are focused on milk production from cows or goats, others on meat production from cattle or sheep. While some are open for tourists and offer attractions such as cafes and guided tours, others are private, closed enterprises. Forest pasturing is generally based on Swedish common pasture rights (ägofredslagen and mulbetesrätten) and thus represents a non-exclusive right of access. Multiple land uses are frequent in areas where forest pasturing is carried out, such as reindeer herding, hunting, various leisure activities and, above all, forestry. All of these are sources of conflict for farmers in the region, whose animals are sometimes said to hinder the activities of other land users. 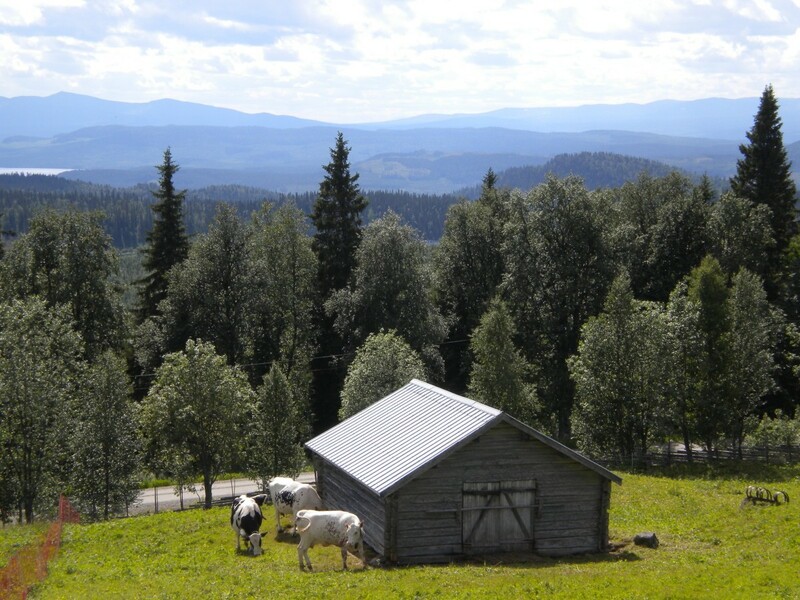 The remaining farmers practising forest pasturing are generally situated in mountainous or marginal areas of central and northern Sweden. They are especially concentrated to the more mountainous northern parts of Dalarna County and to the western part of Jämtland County, with close to 100 farmers in each county (Figure 2). This region is dominated by glacial till soils and boreal forest vegetation. Glacial till soils are generally difficult to cultivate and thus unsuitable for cropping, so the most important cultivated land areas in this region are alluvial soils along river valleys and the shores of major lakes. From the mid-nineteenth century onwards, many mires and wetlands were drained and cultivated, but above the tree line in the more mountainous parts, the soil cover is generally too thin to cultivate. Therefore crop cultivation in the latter areas has been limited and animal husbandry has dominated, with any arable fields available being used for fodder and self-sufficiency. The boreal forest in this region contains extensive naturally open mires that provide grazing rich in grasses, herbs and tree buds, which provide forage for cattle and goats, as well as reindeer and wild deer such as moose (Alces alces). Grazing cattle in the forest are left free-ranging or herded (Figure 2), a practice that is presumed to date back to the Iron Age (cf. Lidman 1963; Montelius 1975). Map. 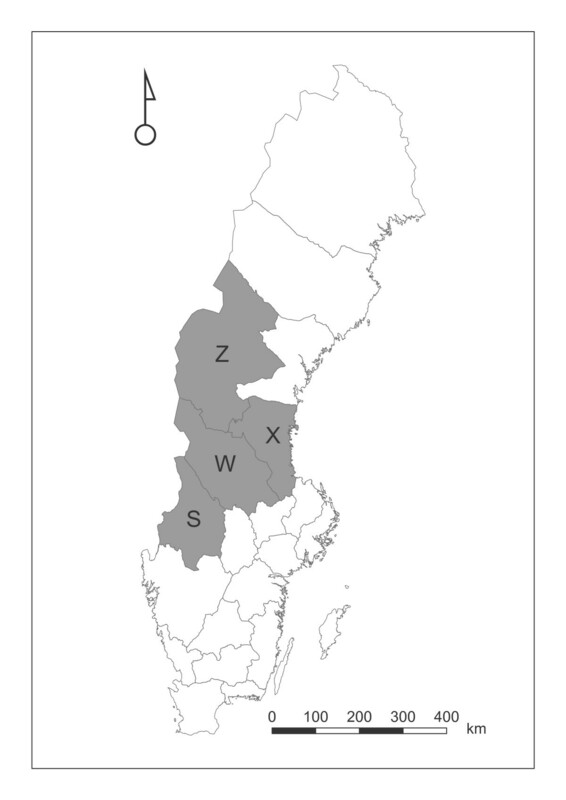 Map showing counties where forest pasturing on summer farms is currently practised in Sweden. Z = Jämtland County (90 summer farms), W = Dalarna County (90 summer farms), × = Gävleborg (60 summer farms) and S = Värmland (10 summer farms). All counties are distinct rural regions with boreal forest as the main land cover. Generally, the landscapes of the eastern parts of this area are undulating, while the western and especially north-western parts are mountainous. This paper draws on ethnographic field research that I undertook in 2009 and 2010 for my ongoing Ph.D. project on the politics of fäbodbruk. The main methods employed were participatory observations and qualitative interviews carried out with around 20 traditional farmers practising forest pasturing in central and northern Sweden. To a more limited extent, I also met with county board representatives, but the majority of my study of policymaking stems from analysing policy documents, media reports and statements made by the authorities and due responses from farmers' associations. There are four associations of summer farm users in Sweden: the national Swedish Transhumance and Pastoralist Association (Föreningen Sveriges Fäbodbrukare) and three regional associations (Gävleborgs fäbodförening, Dalarnas fäbodbrukarförening and Värmlands Säterbrukarförening). During the post-war period, Swedish agricultural policies strongly favoured rationalisation through stimulating a reduction in the total number of farms and an increase in the scale and degree of individual farm specialisation. As a result, Swedish farming practices underwent dramatic changes during the twentieth century. Technological development made traditional farming systems such as fäbodbruk seem backward, and longstanding agricultural propaganda informed farmers of the benefits of abandoning forest pasturing in favour of cultivating fodder for dairy animals. 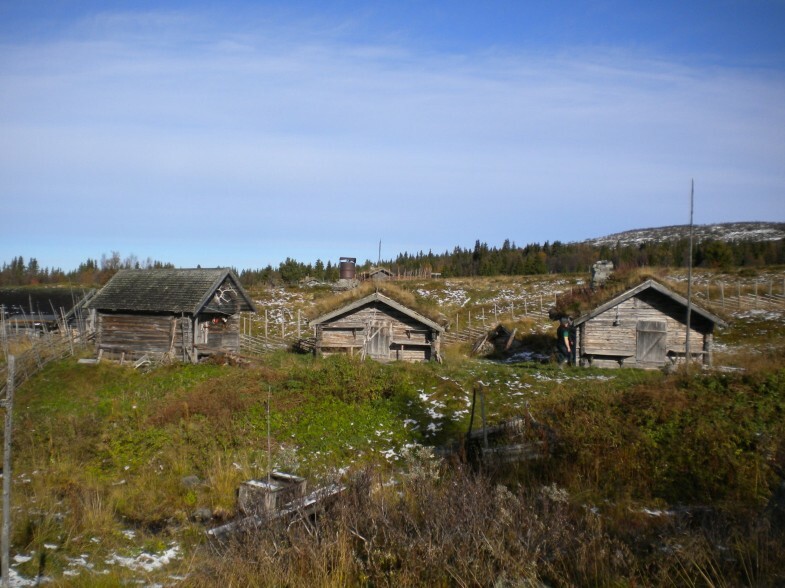 Small-scale farming was seen as a challenge to the creation of the welfare state, as the profit gained from such farming was unsatisfactory compared with the salaries that industrial workers enjoyed from the 1950s and onwards in Sweden. Thus, a number of policies were put in force in order to professionalise and industrialise farming during the post-war years (Flygare and Isacson 2003; Flygare 2004). One example that shows the effects of rationalisation and modernisation policies and their interconnectedness with technological developments is that of the introduction of pedigree cattle breeding. In the 1880s, deliberate pedigree breeding of cattle began in Sweden, since when cattle breeds were formalised, their outputs in terms of milk and meat could be compared and analysed. Ambitious breeding programmes coupled with new medical knowledge and technology during the twentieth century allowed cattle to be altered in a way probably only exceeded by their initial domestication around 7,000 years ago. As a result, the sturdy type of cattle commonly kept in central and northern Sweden was formally named Scandinavian Mountain Cattle (fjällko), hereafter referred to as mountain cattle. These mountain cattle proved to be unusually small, with significantly higher milk fat content, when compared with other breeds in a systematic way. According to farmers (field notes), mountain cattle are very well adapted to their environment in terms of their ability to find pasture and forage for mushrooms, buds and herbs in extensive boreal forests and their willingness to return home by themselves or when called by their herder. Scandinavian farmers practising forest pasturing on summer farms have developed a particular high-pitch singing technique (kulning or kaukning) that travels tens of kilometres in mountainous terrain in order to call their animals home. In the 1880s, the average mountain cow weighed an estimated 180 to 230 kg and gave 1,200 to 1,400 kg of milk per year, according to figures made available by the Swedish Mountain Cattle Breeding Association (Svensk Fjällrasavel, undated). Regional agricultural committees (hushållningssällskap) were given the authority to create breeding plans and prioritise the use of bulls that met breed standards in Sweden. The ability of mountain cows to independently seek fodder in the forest was the reason why Scandinavian Mountain Cattle was recognised as the only suitable cattle breed for northern Sweden by the committee in 1893, and a breeding plan was established for its development. At the turn of the century, merely 20 years after breeding plans emerged, the average mountain cow had nearly doubled its weight and its milk output (ibid.). However, mountain cattle would not remain a rational option for long, as concentrated feed started to replace grazing as the main feed source for cattle in the post-Second World War period. In 1993, exactly 100 years after the formal establishment of the Scandinavian Mountain Cattle breed, a project was initiated for saving the breed, which was by then close to extinction. The rapid development of new technologies was another important factor in the rationalisation of agriculture. For example, the expansion of commercial dairies in the early 1900s was problematic in areas where farmers kept their livestock on forest pastures and produced their own dairy products. In areas where summer farms were used, the village dairy was forced to close down operations during the summer months, when the cows were most productive. Eventually the promise of steady cash income from commercial dairies convinced farmers to keep their cows at home throughout the summer and deliver their milk to the dairies, even though sufficient grazing was sometimes lacking in the village so the cows had to be house fed until they could be released onto aftergrass following haymaking (field notes). While farmers who stopped practising forest grazing generally chose to replace their mountain cattle with larger and more productive lowland cattle, those who continued with forest grazing generally did not. The main reason was that farmers who kept up the tradition of forest pasturing remained dependent on the mountain cattle breed's adaptiveness to its environment. Other reasons listed by the farmers interviewed were that mountain cattle milk is more suitable for home-made cheese production owing to its higher fat content, while lowland cattle is ideal as drinking milk and suits those farmers delivering milk to commercial dairies. Some simply argued that mountain cows are more beautiful, more trustworthy or have gentler ways or a more independent and intriguing mind. This attachment of farmers to their cows deserves some attention, as it is important to understand their reasons for continuity and resistance to change in their farming practices. Small-scale dairy farmers take an ambivalent view of the fact that they have to get up every morning to milk their cows and often direct all their attention to problems as they emerge. On summer farms, the working conditions are also problematic - the animal houses are often small and lack electricity (Figure 3), while the buildings constructed for cheese production are often small and laborious to work in (Figure 4). While this is seen as a problem and a burden, it is also often talked of in positive ways. Most farmers realise that if they shifted from milk to meat consumption they would not only reduce their work burden substantially but also improve their profitability, as current European Union Common Agricultural Policy (CAP) subsidies prioritise keeping the landscape open through grazing, while subsidies for milk production are less advantageous to farmers. However, there are farmers who would rather stop farming altogether than sell their milk cows. The reason for this attitude is presumably the special bond that exists between farmers and their animals. When the practices of forest grazing on summer farms are examined more closely, it is easy to see the intrinsic ways in which animal behaviour and bonds with animals are crucial to the operation (Figures 3 and 4). Animal houses. Cow houses on a summer farm, which provide shelter for animals from mosquitoes and other insects as well as from predators. Summer farms are often subject to cultural heritage preservation rules and thus have to balance the competing interests of preservation and functionality, as well as regulations within e.g. animal health. This picture was taken in Valsjöbyn, Jämtland County, in July 2010. Cheese-making shed. 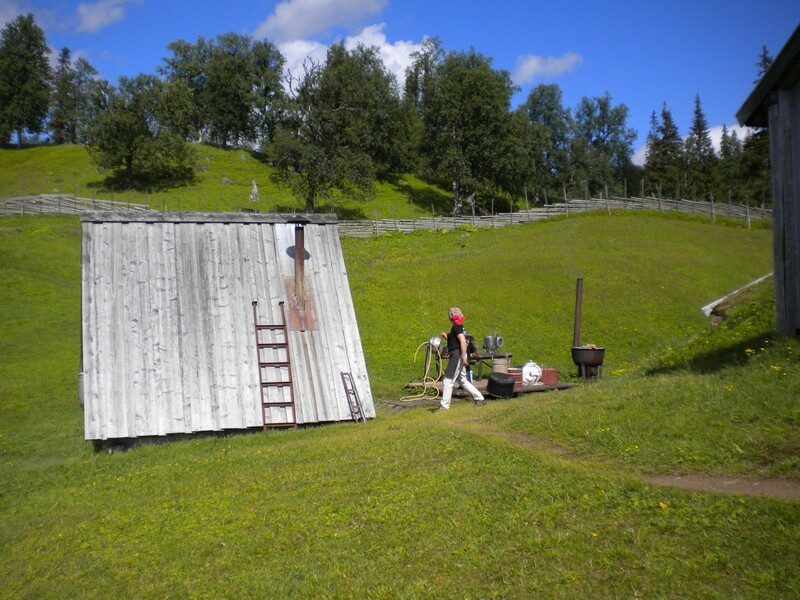 Small sheds (kokhus) are usually built for producing cheese from milk and the distinct Scandinavian whey cheese (mesost) and whey butter (messmör), which needs to boil one full day in order to caramelise and thicken. This picture was taken in Valsjöbyn, Jämtland County, in July 2010. In the newspaper Tidningen Härjedalen on 19 August 2010, the traditional farmer Karl-Olov Sundeberg was quoted as saying that 'we like music a lot and so a while ago Ingegerd [Karl-Olov's wife] and I were to go listen to Tomas Ledin [famous Swedish musician] when he played in Rätan, but then the cows did not come home from the forest so we couldn't make it. But all of that is forgotten the next day because we are so happy with the life we lead' [author's translation and notes]. The milk cows are at the core of the business and the care and affection shown to farm animals was striking in encounters with traditional farmers in the present field studies. Free-range forest pasturing is based on being able to control animal behaviour, as the cows are expected to return home every night by themselves, so a lot of time is invested in creating emotional bonds with the cows. This is not regarded as something specific for this type of farming by the farmers themselves, as it is usually based on tacit knowledge and regarded simply as a necessity that comes with this line of work. Giving the animals the time and patience needed to establish necessary bonds of trust is crucial to these pasture regimes. The cows used in forest pasturing are possibly among the most tame in any livestock raising regime, which is an interesting paradox considering the free-range pasturing that is involved. Farmers practising forest pasturing usually have no more than 30 cows, often considerably fewer (10 to 15), and establish strong personal and emotional bonds with their cows. The cows are generally kept for longer than those in conventional farming systems in Sweden. One farmer interviewed did not even slaughter milk cows, but allowed them to die of old age at around 20 to 25 years. In the newspaper interview with Karl-Olov Sundeberg cited above, he notes that it is crucial for traditional farming that the cows come home by themselves from grazing in the forest. It has not always been so. Historically, the animals were herded, often by young milkmaids. The main reason for doing so was to make sure that the animals did not graze on land used for hay cutting or land to which the farmer had no grazing rights, and to some extent to protect animals from predator attacks (Nyman 1963; Larsson 2009). From the sixteenth to the nineteenth century, when the practice of forest grazing peaked, there are historical accounts of how grazing rights were assigned and maintained by establishing detailed arrangements for grazing and work to be done by each farm household to maintain the grazing quality of the forested pastureland, such as cutting trees and bushes (Larsson 2009). As the number of summer farms in use decreased, there was no reason for herding the animals to keep them off the hayfields or pasture land of other farms. In addition, as labour costs increased and the use of unpaid labour by family members decreased considerably during the twentieth century, herding animals would be economically impracticable nowadays, according to several of the farmers interviewed. Today, if the cows do not come home for milking, farmers face hours of extra labour in locating them and bringing them back. It is rather unusual for cows not to return home, even dry cows, as they need shelter from mosquitoes and gnats, which farmers claim can cause so much distress that farm animals sometimes die from nervous exhaustion. If cows do not come home, it is most often due to mushrooms. Cows find mushrooms very tasty and according to farmers, they also eat hallucinogenic mushrooms that make them lose track of time and space. One farmer told me they behave like drunken teenagers. Others claim that the tastiness alone explains why cows move further and further away from home, as they lose judgement and get so full eating mushrooms that they cannot cope with walking all the way back once they realise how late it is and the mosquitoes come. Regardless of the reason, mushroom season is a problem for traditional farmers with free-ranging cows on forest pasture. However, another reason why cows might not return home is if a lowland cow is leading the herd. The belief that lowland cows cannot find good fodder in the forest or manage to get home on time is widespread among farmers. On several occasions, I was told by farmers that the traditional breeds, mountain cattle and a breed with similar qualities to mountain cattle called red cattle (rödkulla) (Figure 5) that is more common in central Sweden, are light enough to walk through mires without sinking and fit enough to walk tens of kilometres seeking fodder every day. The larger lowland breeds are heavier and get tired from walking, and are often found lying resting somewhere, according to farmers. As one farmer said, even a herd of cows with a majority of mountain cattle could fail to return home in time if the dominant cow is a lowland cow. Therefore, it is important for farmers to ensure the dominant cow in the herd is of a suitable breed and with suitable qualities. This is not always easy, as it is not clear what makes a cow a leader. Age is one important factor but not the only one, as one farmer claimed that mental strength and displaying braveness and boldness are also important. A second farmer said that he could try to intervene and push for a certain cow to become the dominant one, for example by putting her first in the herd. However, the cows will ultimately decide among themselves who will be number one through violent fights, which I witnessed myself while participating in moving cows from a farm to a summer farm in the beginning of the grazing season (buföring), a walk of around 35 km in this particular case (Figure 5). Traditional cattle breeds. This picture shows mountain cattle (fjällko), and red cattle (rödkulla) pasturing in the forest outside Rättvik, Dalarna County, in June 2010. Farmers claim that traditional breeds are better adapted to forest pasturing, as they are lighter and better suited for feeding on the buds, herbs and thick grasses that grow in forests and mires. Several farmers described how mountain cattle and red cattle have advanced systems of knowing when and how to find feed and where to walk safely, skills that appear mystifying even to farmers. Others highlight their high-quality meat and milk. Their meat is said to be tastier and leaner, as the cows are fit and sturdy. Their milk is said to be of better quality and have a fuller and deeper taste thanks to the rich variety of fodder that the cows eat, resulting in cheese that tastes different every time. For these reasons, a number of farmers practising forest pasturing are active members of associations meant to strengthen and protect traditional breeds and which in various ways aim to affect policymaking within this field. As in other areas, the view on traditional breeds has been reversed when it comes to agricultural subsidies. Today, there is a specific EU subsidy for farmers keeping traditional breeds, paid out per head for individual animals with the right genealogy (SJVFS 2011). Mountain cattle (fjällko) and red cattle (rödkulla) are both eligible for this subsidy. For mountain cattle and red cattle to be considered pure breeds, their father and grandfather on the mother's side must both be considered 87.5% pure and their mother 80% pure (SJVFS 2011). This might seem easy enough, but genetic purity in cows has become a heated issue as the deliberate breeding plans initiated in the late 1800s altered mountain cattle to such an extent that some people argue that they should not be considered an authentic traditional breed any more. This has caused a division in the Swedish Mountain Cattle Breeding Association, with some members having chosen to leave the association and form a new one dedicated to breeding an 'unrefined' version of mountain cattle initially based on three bulls located at remote smallholdings in northern Sweden. Currently, there are around 200 cattle that belong to the unrefined version of Swedish Mountain Cattle (fjällnära ko), while the number of generic mountain cattle has reached 4,000 individuals (Föreningen för Äldre Svensk Boskap 2008). So far, there are no specific agricultural subsidies available for the unrefined version of mountain cattle. However, the accounts of farmers on the qualities of traditional breeds and their rationale for keeping them have not affected policymaking or attitudes among authorities to any great extent. Apart from the EU subsidy for keeping traditional breeds, there are no other politically stimulated incentives to keep them. On the contrary, there are indications that the authorities maintain a negative take on traditional breeds when it comes to their use in producing agricultural goods, while encouraging mountain cattle to be used as an instrument for cultural heritage production. One example is provided in the magazine Fjällkon (2011) distributed by the Swedish Mountain Cattle Breeding Association to its members; a disappointed farmer tells the story of how he wanted to start up a new dairy farm with a herd of mountain cattle. When he applied for investment support, another EU-funded measure, he was allegedly told by the county board in his region that the idea of keeping mountain cattle for milk production was absurd as he could never develop that into a profitable business. He was advised instead to keep mountain cattle for meat production and to obtain the EU grazing subsidy. Current predator policies provide a good case for discussing which biodiversity matters and how natural heritage is defined in contemporary policymaking. Summer farms are supported by the Swedish Board of Agriculture through EU subsidies, as the grazing regimes employed result in a species-rich flora and high nature values in the forest. Most farmers interviewed in the present study claim it is possible, although certainly not unproblematic, to combine free-range forest grazing with brown bears (Ursus arctos, hereafter referred to as bears) resident within the grazing area. However, all the farmers I talked to claim it is impossible to combine free-range forest grazing with wolves (Canis lupus) also resident in the grazing area, for various reasons. The Swedish Environmental Protection Agency is protecting and managing the number of wolves present in each Swedish county. Wolves are said to be native to the Swedish fauna and as such they make up a natural heritage (Herlitz and Peterson 2011). Wolves make an important symbol of the wilderness associated with northern Sweden (ibid. ), while grazing subsidies represent the common perception among ecologists today that semi-natural pastures hold the greatest biodiversity. Both the Swedish Board of Agriculture and the Swedish Environmental Protection Agency have decentralised part of their decision making to the regional county boards, which are now experiencing difficulty in effectively implementing conflicting policies. The historical background to the heated public debate on predator policies in Sweden is described briefly below. Predators are not evenly spread in Sweden but are concentrated to central and northern Sweden, overlapping precisely with the area where traditional farming with forest pasturing is practised by some 250 farmers as of 2010 (Figure 2). Bears have remained a part of the Swedish fauna all through the twentieth century, even though their numbers have fluctuated, but wolves have slowly re-established since the 1970s, following a period of near extinction. Predator encounters are much more common in traditional farming with forest pasturing than in conventional farming. Around 18% of all predator attacks in 2009 occurred on forest pasturing (Viltskadecenter 2009), while farms practising forest pasturing make up around 0.0035% of Sweden's 72,000 farms (Jordbruksverket 2011). The total number of predator attacks on domestic animals in 2009 was 687, 493 by wolves and 99 by bears (Viltskadecenter 2009). As the wolf population in Sweden was an estimated 186 to 215 individuals in 2010 (Wabakken et al. 2010) compared with a bear population of an estimated 3,221 in 2008 (Kindberg et al. 2009), it is clear that wolves cause more problems to farmers both in total numbers and in relative numbers. Up until 2007, it was forbidden to shoot wolves, a regulation which was heavily criticised by Swedish farmers (not only those using summer farms) wishing to defend their animals. This resulted in a policy change in 2007 that legalised shooting wolves during an ongoing attack on domesticated animals or humans. However, at summer farms many attacks on animals take place in the forest while grazing and furthermore, many of the farmers I interviewed do not own a gun and derive no benefit from this law. Farmers do have the right to file a complaint to the county board requesting for a particular wolf to be shot as a protective measure, called 'protective hunting' (skyddsjakt). The county boards are generally very restrictive on using this possibility of controlling predator damage and there were accusations by the farmers interviewed here that the county board stalls the decision until the grazing season is over. When the animals are taken back from forest pasturing to their main farmstead, the application for protective hunting is automatically denied, since the attacked animals are no longer in the area where the attack took place. Policymaking concerning predators is one of the main issues that the Swedish Transhumance and Pastoralist Association and regional summer farm associations are trying to influence. In 2010, during a meeting attended by the author, the Swedish Transhumance and Pastoralist Association established an internal predator policy stating that the association is not categorically negative to the existence of predators in Sweden, but that they should not be allowed to be resident in areas where summer farms are in use. Another standpoint made clear is that the Association is opposed to licensed wolf hunts such as those organised in 2010 and 2011 and wants to see a more liberal approach in allowing protective hunts instead. Their reason for arguing that protective hunts are more efficient is that licensed wolf hunts do not tackle individual wolves that have proven to cause problems. Furthermore, the hunt itself is not organised in a way that scares wolves away from settled areas. Protective hunts are in fact seen as the main instrument available to prevent predator-related conflicts by the Swedish Transhumance and Pastoralist Association, as is made clear in a statement to the Environmental Protection Agency (Föreningen Sveriges Fäbodbrukare 2011). A number of recommendations have been made by the county boards and other agencies to prevent predator attacks, but all of these have focused on fencing the grazing animals in, which in effect means that free-range forest grazing is not compatible with these measures. When a farm animal is killed by a predator, the Swedish authorities provide a set sum of compensation for the value of the animal. However, the greatest costs caused by predators to farms practising forest pasturing are not animals killed, but changes in animal behaviour, which farmers claim as threat to the basis of their farming practices. These include animals not returning home at night, decreasing milk production and occasionally, although more frequently in sheep than cows, spontaneous abortion or infertility during the following insemination season. All these effects are said to be the result of stress but are inherently difficult to account for. In most cases, farmers notice that predators have come close to their cattle when they find their herd has scattered. This is usually not noticed until it is time for the cattle to come home to their stalls in the evening and they fail to do so. Cattle can also hurt themselves as they flee from predators, even when they are fenced in, as they run straight through the fence. After being collected and put back in their stalls they can become unmanageable or prove to be less trustworthy during daily routines such as milking or being sent out to graze in the forest. In one such case when cows showed increasing aggression after having been in contact with bears, a local official recommended that the cows be put down, as they had become afraid of predators. The farmer was also recommended to place bear skins in the stall to get the animals used to their smell, supposedly making them less afraid. The farmer told me that he did not agree with this advice, as he thought that, if anything, cows with an instinct to flee predators would have a better chance of surviving predator attacks, but complied anyway as he was worried that not complying would damage his relationship with the authorities. The farmers and farmers' associations affected have held a number of meetings among themselves and with relevant authorities and other sector organisations in an attempt to reach a solution to these problems. It is a commonly held view among farmers that forest pasturing is difficult or impossible to pursue in areas where predators are present, especially wolves. Sami people using forested areas for free-range reindeer pasture share this opinion, but have been more successful in their negotiations with the Swedish government. An agreement has been reached whereby reindeer pasture areas are to be kept free from resident wolves. Wolves that show signs of becoming resident within reindeer pasture areas are thus moved or shot with the permission of the Swedish Environmental Protection Agency (Regeringskansliet 2009). Farmers practising forest pasturing for cattle often argue that they should be granted the same right, which is also the policy of the Swedish Transhumance and Pastoralist Association. As mentioned above, farmers view bears as being less problematic than wolves. This is mainly because not all bear individuals cause problems. One example was given by a farmer who told me how a bear sow has lived for years within her forest pasturing area without ever causing any problems. Every year the farmer fears that what she calls 'her' bear will be shot in the annual bear hunt (unlike wolf hunts, licences for bear hunts are issued yearly as their numbers are not considered to be threatened), and that a new, more aggressive bear will settle in her territory instead. Other farmers have had major problems with frequent bear attacks, especially but not exclusively on sheep, and are more negative about the possibility of combining free-range pasturing with bear presence. One way of tackling the predator-grazing conflict is to downplay the importance for biodiversity of forest grazing at summer farms, and to focus instead on the importance of the practice for tourism and cultural heritage. In changes made to the Rural Development Programme 2007 to 2013, what used to be a set sum (7,000 SEK) per livestock unit and year was replaced by a fixed sum (18,000 SEK) paid out for 'summer farms in use', complemented by a halved sum per livestock unit (3,500 SEK; Statens Jordbruksverk 2007). No official justification has been offered by the Swedish Board of Agriculture as to why the subsidy has been modified, which has caused the farmers' associations to draw their own conclusions. At the very first meeting between farmers and a county board that I attended as an observer when I started my fieldwork on 2 December 2009, I was puzzled by a question from a farmer to the officers about whether they seriously thought that the forest had been overgrazed as a result of farmers having put as many livestock units as possible on forest pastures, with minimal surveillance, simply to maximise their profits from EU subsidies. According to the farmer, who was a representative of one of the farmers' associations, this had been a written justification in an early draft of the new Rural Development Programme but was deleted in later drafts. A heated discussion arose where the county board officials generally agreed that there had been no cases of overgrazing, although there had been tendencies for 'ranching' rather than traditional summer farming in some cases. It is thus apparent that using a summer farm and practising forest pasturing and obtaining subsidies for this activity involves agreeing to keep the practices at a minimum level of authenticity - although it is not spelled out exactly what this entails. There have been a number of fears on how the forest grazing subsidy could be misused, that could be of some guidance in understanding the struggle for authenticity at play here. One example is that the Board of Agriculture has specified that horses can be used to fulfil the minimum grazing pressure, which is 0.2 livestock unit per hectare of grazing land (SJVFS 2011). However, horses can only be kept if the farmer keeps a minimum of 1.5 livestock units of cows, sheep or goats. These might seem irrelevant details, but the fact that the terms of the subsidy are so rigorous tells us something about what is considered traditional, but also how problematic it is in national policymaking to define what is traditional. The reason for not allowing summer farms to only keep horses must be considered in relation to the fact that horses are associated with a middle class peri-urban lifestyle. Narratives that dominate media representations speak of resourceful middle class urbanites buying up former smallholdings to keep horses for leisure, not production. Thus what rural areas might gain in gentrification they lose in local prospective farmers being pushed out of the market due to increasing real estate prices. Horse farms stand out not only as competitors for land but also as threats to traditional farmers and the romanticised asceticism associated with summer farms, which (ideally) lack all comforts such as electricity, running water and means of transportation. Put differently, one could say that horse farms are associated with rurality as a scene of middle class consumption (Marsden 1999), rather than a place of agricultural production. Smallholdings taking their animals to summer farms find themselves between these two depictions of rural areas as a place of consumption or a place of production. There are also two competing views on the summer farm: either as a tourist resort with quality cheeses and recreational experiences, or as a place with high nature values in terms of biodiversity in semi-natural pastures and hence a place producing biological values through grazing. These words were spoken by a farmer to the county board officers at the information meeting referred to above. The meeting was convened by the regional county board in order to inform farmers about the changes in EU subsidies for summer farms. Around 30 to 40 farmers participated in the meeting. This particular farmer was critical of the county board's view that tourism can be the main income for farmers. This shift in view of farms producing agricultural goods to instead producing heritage values is certainly problematic not only for policymakers, but also for farmers who find their new role discomforting. In spite of rigorous and generally highly successful policies intended to rationalise agriculture, a number of farmers have still chosen to uphold what are now referred to as 'traditional' systems, as industrialised, large-scale units have become the new standard. Traditional farming is characterised by using 'traditional' breeds and 'traditional' feed for animals, which in central and northern Sweden is forest pastures. The identification of heritage values and of what is considered 'traditional' in these farming systems is made by external parties, not the farmers, whose view of a summer farm or cattle breeds is not necessarily the same as that imposed on them by the authorities. Generally, while farmers tend to define what traditional is in farming as continuity in farming practices, authorities tend to focus on what is non-traditional. The actual practices of farmers when creating the summer farm landscape seemingly play a minor role in the value judgements assigned to it by the authorities. The example of pedigree versus traditional breed policies shows that authorities have given conflicting advice and signals to farmers over the years as the considered 'real value' of traditional breeds have changed from being an animal that optimised for its environment to a breed that represents cultural heritage. For farmers, however, traditional breeds remain an animal optimised for production in its environment. The example of grazing subsidies versus predator policies shows that different sector interests produce conflicting outcomes even when played out at one particular time. While predators co-existing with a touristic summer farm with few grazing livestock is not necessarily a source of conflict, the summer farm that maximises biodiversity through keeping a larger number of grazing livestock is. The 'real values' of biodiversity in summer farms versus touristic values in summer farms is thus proven to be conflicting and negotiable. These cases show that it is certainly not an easy task to judge what cultural or natural heritage is or, even less so, should be. The fieldwork carried out for my ongoing PhD project was funded by the Swedish University of Agricultural Sciences (SLU). Some fieldwork activities were funded by scholarships from the Swedish Society for Anthropology and Geography (SSAG) and the Royal Swedish Academy of Sciences (KVA). SLU, SSAG and KVA played no role in the design, collection, analysis or writing of the manuscript.